Aspire Indiana Health’s very busy late summer season was capped off by the wonderful news that we have achieved look-alike status as a Federally Qualified Health Center. This is something that we have been working toward since the inception of AIH over two years ago and we could not be more happy and proud! For more information about this outstanding achievement, please see the press release here. Aspire Indiana Health offers free pregnancy testing at its primary health care locations in Anderson and Elwood. The free tests are part of our Healthy Beginnings Program aimed at reducing infant mortality in Madison County by safeguarding the health of mothers-to-be and babies. For more information, please call 765-552-5009. Flu shots for this season are in! Please come in and get one and help protect yourself from becoming ill with flu. The shots available at AIH are the quadrivalent strain, meaning they protect against four separate flu strains. Shots available outside of Aspire Indiana Health may only be trivalent, meaning they will only protect against three strains. In the words of AIH Chief Operating Officer Syd Ehmke: “When it comes to flu protection, more is better!” Call any of our primary care offices to make an appointment. 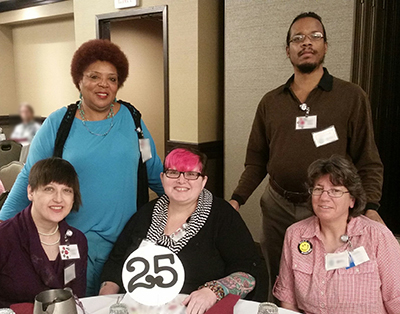 On Friday, September 15th, I had the privilege of joining nine other representatives from Aspire at Key Consumer’s 25th Mental Health Education and Recovery Conference at the Crowne Plaza. I’m sure that we all had different perspectives on the event because we represented Aspire as staff, consumers, peer specialists, Consumer Advisory Committee members, and group home residents. What I hope we all noticed was that all of the participants were so eager to be there and learn more about mental illness and addiction recovery. Some of the main points discussed at the conference were: the opioid crisis, suicide prevention (and some events on how to get involved), and the newly formatted clubhouse. Serge Blasberg, the keynote speaker, spoke of his journey through mental illness. We learned how he became involved with Clubhouse International. And, we learned the number of lives he has been able to impact as a peer specialist. The breakout sessions focused mainly on wellness, and they were my favorite parts of the day. I went to “Benefits of Companion Animals” and “Zentangle”. Other choices were several types of yoga, and there was a group on benefits, and one on relationships. “Zentangle” is somewhat like doodling, but there are specific patterns, and it is done with a purpose. There is no wrong in Zentangle. Breathing and focus are very important in this form of relaxation/ meditation/art. This is a great skill for mindfulness. The Key Conference was educational, relaxing, and fun. It was a great opportunity to learn new relaxation and calming skills. There were also an abundance of resources available. I’m really thankful to Aspire for being a sponsor and for allowing me to go. Jessica Slaven, a Recovery Coach at Aspire, organized Anderson’s first International Overdose Awareness Day event on August 31, 2017. Over 100 people packed into Anderson Fire Fighters Local 1262 to hear personal stories of loss and recovery from overdose and substance abuse disorders. Jessica made an educational presentation at the event that had a real impact on the audience. Many thanks to Jessica for her dedication to the Anderson community. On September 10, 2017, a group of Aspire staff members participated in a fundraising walk at the Anderson Speedway to raise awareness for suicide prevention. Team Aspire included Captain Ola Smith, Daniel Smith, Lesley Chodkowski, Eldon Chodkowski, Jessica Slaven, Tina Skeel, Jim Skeel and Jerry Landers. It is not too late to make a donation to the Out of the Darkness Suicide Prevention Walk on behalf of Team Aspire. Just click here! The nearly record-breaking temperatures on Saturday, September 23, 2017, didn’t stop our HIV Services team from having a great time at the Indiana AIDS Walk. Individuals and groups from all over the state came together in downtown Indianapolis to stand up against stigma, celebrate successes in the HIV/AIDS field, and remember lost loved ones. The Aspire Indiana Health X3 team raised nearly $750 and won an additional $1000 as the top team in the Penny Wars. Thanks to all who donated and a special shout out to team members Julie Foltz, Shelby Barbee, Deric Batt, Michelle Briles, Bri Cummins, Wendy Cummins, Kyle Denton, Darin Foltz, Jesse Green, Laura Groleau, Erin Holbert, Stephan Horn, Kori Jennings, Mona Mehas, Holly Rock, Bonnie Stuefen, Holly Valvas, and Kari Wilhems. For more details about the Indiana Aids Walk, please check out team member Deric Batt’s moving blog post.